Snrky: Is dolting not an option? Is dolting not an option? * Or dafting? Absurding? Maybe idioting? * Just pick one, dummy. I always worried it was just me when I thought sometimes people used some of these interchangeably. Per the first link below, everyone seems to agree on mock, but after that the agreement on terminology breaks down. I was on a panel at a kids' innovation camp last week, and one of the project managers talked about how her job was to get everyone to agree, or at least accept, a definition. I told them about the security meeting we'd had to discuss the meaning of "done" and urged them to discuss the meaning of that word with the adults in their lives when it came to chores to get some first hand experience with a disagreement about a basic definition. 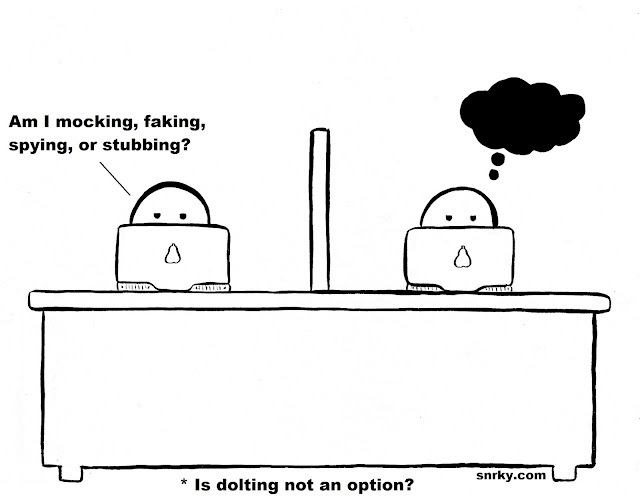 Snarky: Am I mocking, faking, spying, or stubbing? Title: Is dolting not an option?